Imagine that you go to your local supermarket and buy a packet of chips. You come home, keep the packet in your kitchen, and then go around doing your daily work. Life takes over and you forget that you ever bought a packet of chips. At this point, how likely are you to buy another packet of chips of the same brand? Next time you go to the supermarket, you might pick up another brand of chips. Instead of becoming a raving fan of a particular brand of chips, you were happy to buy chips of any brand. You never became a repeat customer of any particular brand of chips. And why did this happen? Because you never consumed those chips. You never ate them to find out how good their taste was. If you had tasted the chips of a particular brand, you might have liked them and found that this brand of chips was actually much better than the other chips available in the market. But you never found that out because you never consumed those chips. If you had consumed those chips, you might have become a repeat customer of that brand. But without any consumption taking place, the likelihood of you becoming a repeat customer of that brand reduced to zero. Consumption is the easiest way to get repeat customers. If you are able to make your customer consume your product, then there is a high probability that they will turn into repeat customers. But without your customers consuming your product, it is unlikely that they will buy again from you. So why is this consumption so important and how can you make your customers consume your product? Why Consumption Is So Important To Get Repeat Customers? Imagine visiting a website and never reading much of what is written on it. Would you visit that website again? Imagine buying a book and never reading it completely. Would you buy another book from the same author? Imagine buying an online course to learn something but never completing the course in its entirety. Would you buy another online course from the same trainer again? Imagine going to a restaurant, ordering food but never eating it. Would you go back to the same restaurant again? Without actually consuming the product that you bought, it is very unlikely that you would buy another product from the same company. Consumption is the key to get repeat customers. 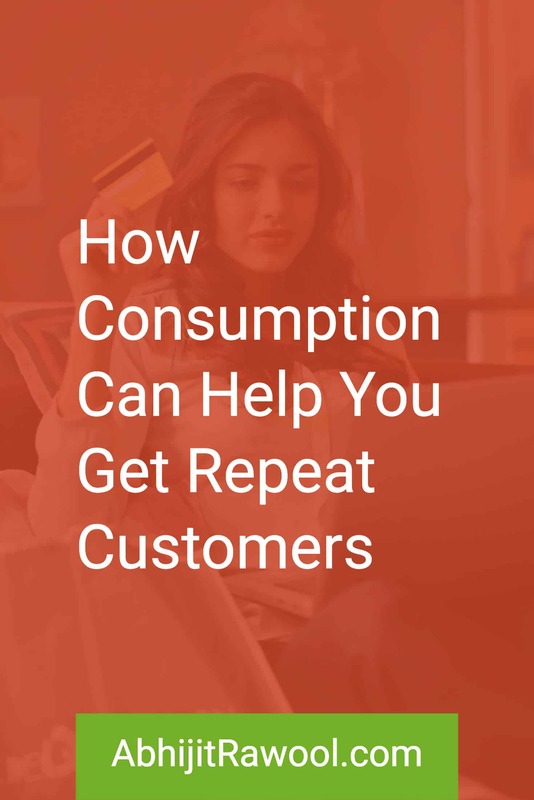 Without consumption, there are no repeat customers, no repeat sales and no repeat revenue. So you have to make your product consumable, else it is very unlikely that your customers will turn into repeat customers. But how do you actually make your product consumable? How To Make Your Product Consumable? Let’s take a detailed look at each of these steps. I have taken a lot of online courses over the years to learn different aspects of running a website. And the first feeling that I usually experience while starting any online course is that of overwhelm. Most of the online courses, dump all the modules and lessons filled with an enormous amount of content on their students without realizing that the students are bound to get overwhelmed with too much of information. So when I created Brand Your Website course, I had to make sure that I removed the overwhelm right at the start of the course. Brand Your Website course teaches people how to properly brand their website. And a couple of ways to do it is by selecting correct fonts and colours for the website. So instead of making the students choose a number of different fonts for their website, the course makes them choose just 2 fonts and then shows them how to use those fonts on their website. Also, instead of making them choose a number of different colours for their website, the course makes them choose just 3 to 4 colours so that they don’t get overwhelmed in selecting colours. If the course is not designed to do this, then the students are bound to get overwhelmed. They will get lost in the world of fonts and drown in the sea of colours. By reducing the number of fonts and colours to just a few, the students don’t get overwhelmed and are more likely to complete the course in its entirety. Removing the overwhelm of consuming your product makes your product instantly consumable. It is one thing to remove the overwhelm that comes with consuming your product and a completely different thing to make your customers start consuming your product. And the easiest way to make your customers get started with your product is by educating them to start consuming just one of the features of your product. Brand Your Website course starts off with educating the students about how to plan their branding strategy. But why is the course designed to do this? Because the students have to start somewhere. By isolating their focus on just planning their branding strategy, they are able to get started quickly with the course because planning something is less intensive than actually doing the work. Once they start with just this one lesson on planning, they are well on their way to consume the rest of the lessons of the course. But just starting this consumption process is not enough. Your customers should also be able to completely consume that first feature of your product at a faster pace. Else there is a chance that your customers will get overwhelmed and will not consume the rest of your product. In Brand Your Website course, the lesson on planning the branding strategy, makes the students plan out the various things that will be needed for branding their website. Because of this the students can quickly understand what is needed to brand their website. This increases their confidence and the feeling of accomplishment kicks in. Achieving this feeling of accomplishment right at the start of consuming a product is extremely essential because it will encourage your customers to consume the rest of your product. And once they start consuming the rest of your product, they are well on their way to become loyal and repeat customers of your business. But how do you make it easy for your customers to start consuming the rest of your product? Ever seen a baby learn to walk? A baby learns to walk by taking small steps at a time. And therein lies the answer to make your customers consume your product completely. You need to educate your customers to start consuming your product in small increments. Break down all the features of your product into small chunks and then educate your customers how to consume each small chunk of your product. It is easier to consume a small chunk of a product and then move on to the next one instead of trying to consume the entire product in one go. In Brand Your Website course, the students are made to first select colours for their website, then select the fonts, then design a logo and finally to brand the images on their website. They are taught one lesson at a time in small increments leading to the completion of the course. We all tend to learn in small increments, so make use of this basic human tendency. By making sure that your customers are able to fully consume your product, you will increase the chances of converting them into repeat customers. Don’t ever forget that without consuming your product completely, your customers might never convert into repeat customers. And the three simple steps to make your product consumable are to remove the overwhelm that comes with consuming your product, educating your customers to start consuming just one of the features of your product, and then to make your customers consume the rest of your product in small increments. Now that you know how to get repeat customers, how are you planning to put this into practice in your business? Got any ideas? Or any questions?